Our Mission: To ensure access to outstanding programs, services and community amenities that contribute to the quality of life in Tracy. Our Vision: Together, we create memorable experiences that link Tracy's past, present, and future. Strengthens community image and sense of place. Our recreation and art programs are available to view and register online at www.tracyartsandrec.com or call (209) 831-6202 to have an Activity Guide mailed to you. We offer transportation services through the Tracy Municipal Airport; Tracer Public Transportation and Bikeways; we provide Library services and programs; we offer a multitude of Recreational Services for all ages of our community and we make Tracy's Parks and Community Facilities available for general use and for rentals. 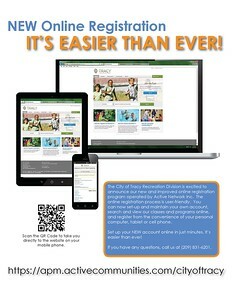 NEW Online Registration Program - It's Easier Than EVER! Check out our latest email blast!